Changes in banking laws and the constantly shifting sea of federal banking regulation have made keeping abreast of the latest changes not only more difficult, but also more necessary than ever. Wolters Kluwer can help keep you up to date with Bank Digest. In addition, the Bank Digest includes relevant information that impacts the banking industry from the U.S. Supreme Court, Congress, the Department of Housing and Urban Development, and the Securities and Exchange Commission. 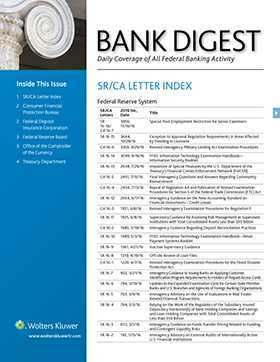 Bank Digest also provides additional detail of significant events in our many weekly and monthly features, including: Regulatory Calendar, with proposed rules and comment periods; and Legislative Update. Top law firms and banking institutions rely on Bank Digest to stay on top in this dynamic industry. Each issue of Bank Digest contains concise abstracts of all of the day's releases which will quickly guide you to the events likely to impact your firm or its clients. Plus the full text of every release is only a click away...even releases that are not available electronically anywhere else.